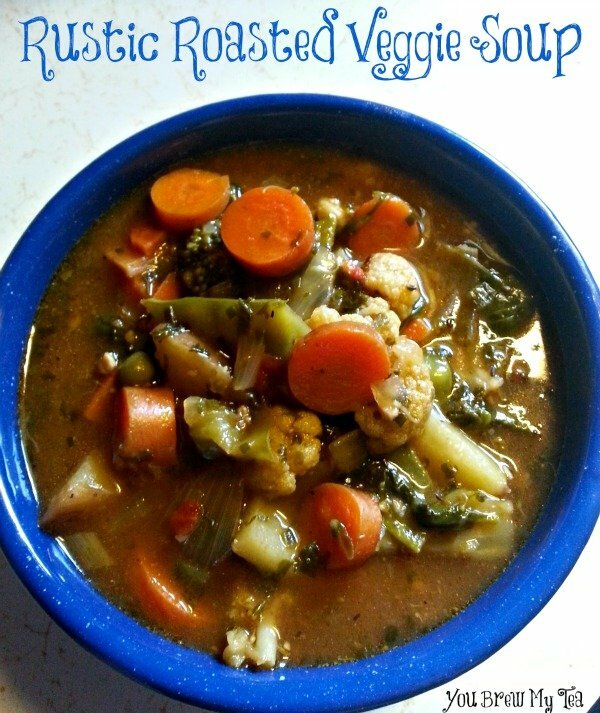 This Vegan Vegetable Soup Recipe is a great idea for a delicious meal that uses up those bits and pieces of vegetables you have left in your refrigerator. While it has been a favorite of mine for years, I didn’t realize until recently that it is actually a vegan option. That makes it both Weight Watchers soup friendly, but also a perfect meal for anyone that is vegan or vegetarian. I decided that since we love our roasted vegetables so much, why not add them to the pot of soup? If a roasted veggie has a much richer flavor on its own, wouldn’t it create that same richness in a simple soup? The result far passed what I expected and will definitely be on our menu plan frequently year round. The best part is that the Wee Child totally loved the soup and even ate some broccoli and cauliflower – items he never likes. This post contains affiliate links. If you make a purchase from my links, I will earn a small commission. We routinely eat roasted vegetables, and this recipe is even easier if you have leftover roasted veggies. If not, then follow the directions below for a great meal that is ready in a short time, and satisfies your cravings while also giving you a great healthy vegan vegetable soup recipe. As a side note, I love using Raw Spice Bar to stock up on my spices like the smoked paprika in this recipe. They send quarterly boxes of great spices, and it’s an excellent way to get a little bit of something you don’t use often, but want to have on hand. Spread potatoes, carrots, broccoli, cauliflower, and onion onto a baking sheet. Bake at 400 degrees for 20 minutes, turning once halfway through cooking time. In a large stockpot, add roasted vegetables, garlic, snow peas, spinach, seasonings, broth, water, tomato sauce, and liquid aminos. Stir well. Bring soup mixture to a boil, reduce heat, and simmer for 30 minutes, stirring occasionally. Crockpot: After removing vegetables from the oven, combine with all other ingredients in a Crockpot, and cook on low for 3 hours. Instant Pot: After removing vegetables from the oven, combine with all other ingredients in Instant Pot liner. Place lid and set to seal. Set to Soup, and cook for 10 minutes. NPR for 5 minutes, finish releasing pressure and serve. In a large stockpot, add roasted vegetables, garlic, snow peas, spinach, seasonings, broth, water, tomato sauce, and liquid amino's. Stir well. This rustic and roasted vegan vegetable soup recipe is a great meal to create in large batches. It will freeze beautifully and be a great last-minute warm meal on a cool evening this Fall or Winter. With no fats, no meat, or dairy, it makes a great vegan or plant-based meal option. If you are looking for healthy comfort food, this soup is the best choice! I’ve been doing more meatless meals at our place, so this fits right in. It looks and sounds amazing. I pinned it so I can try it very soon. I think WS will love it. This going to be my first Fall/Winter as a vegan, and this soup sounds like something I will make a lot! oh sounds and looks so scrumptious! I too have a hard time getting that perfect broth. I can’t wait to try this! Your soup recipe looks marvelous!! I can’t wait to try it. This sounds SO good! I love roasted vegetables and this will be perfect for Fall! Pinned! I just roasted sweet potatoes with pineapple, coconut, honey and ginger tonight. It was delicious! 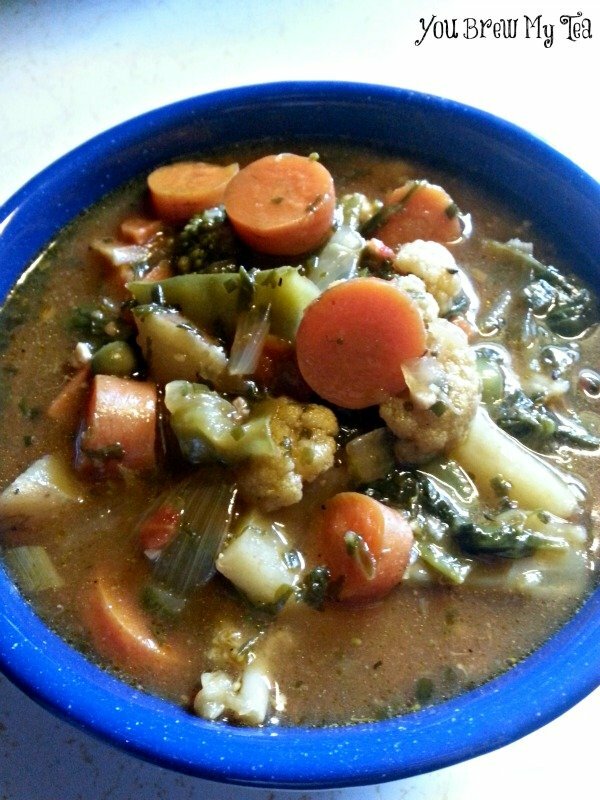 I love homemade veggie soup….and roasted veggies = delicious! Looks delicious. Perfect for cold days in Ohio. Roasting vegetables really makes for a richer soup. Love your seasoning too. Bring this by Weekend Bites today.. others would love to check it out. YUM! This looks good. I’ve been trying all kinds of new soups this year and I need to add this one to my list. Thank you for linking up at The Wednesday Round Up and we hope to see you back next week!